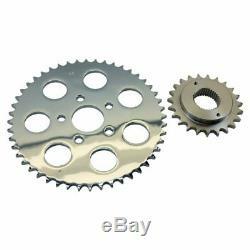 Quality USA made front steel sprocket and durable chrome plated steel rear sprocket provide long lasting performance. The 23 tooth front sprocket and 48 tooth rear easily bolt in place of your existing pulleys and provide gearing that is nearly identical to your OEM Sporty belt setup. This kit fits all 5 speed Sportster® XL models produced from 1995-99 including 883 and 1200 cc models. These are also great for high horsepower applications or anyone looking for a more traditional look than a belt provides. We have also verified that it fits the TC Bros.
Rear sprocket center locating hole measures 1.986in for 1999-older wheel applications (Timken bearing type with 3/4 axle). If you install on a different frame application, you may need to cut your own wheel spacers to get proper chain alignment. Rear sprocket will not fit model year 2000-newer wheels with 2.208in locating diameter (sealed bearing type). World Class Tech Support & Customer Service. The item "Belt to Chain Conversion kit 95-99 XL Sportster Harley Bobber Chopper Sprocket" is in sale since Thursday, November 29, 2018. This item is in the category "eBay Motors\Parts & Accessories\Motorcycle Parts\Drivetrain & Transmission\Pulleys & Tensioners". The seller is "tcbros" and is located in Wauseon, Ohio. This item can be shipped worldwide.